Your Body: a Temple or a Tomb? 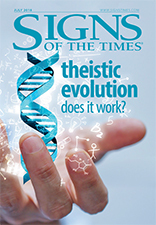 Seventh-day Adventists, the publishers of Signs of the Times®, are known for their emphasis on health. Loma Linda, California, which is a predominantly Seventh-day Advent��ist community, is one of several so-called Blue Zones around the world—places where people live significantly longer than the general population. But why is this? Why do Seventh-day Adventists tend to live longer than the general population? 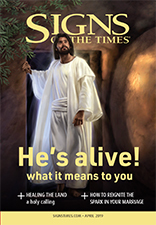 One answer is the Adventist emphasis on health. They view the human body as a temple of the Holy Spirit (1 Corinthians 3:16), which is to be intelligently and respectfully cared for in honor of the God who created it. Along with exercise and rest, Adventists promote a healthful diet, preferably vegetarian, and, like Jews, they abstain from foods that are identified in the Bible as “unclean” (Leviticus 11). And long before it became medically fashionable to abstain from alcohol and tobacco, Adventists promoted total abstinence from both. However, Adventists try to avoid legalism in their promotion of a healthy lifestyle, for it certainly is not a substitute for faith in salvation. Rather, healthful living is consistent with the New Testament precepts laid out by the apostle Paul, the great expositor of salvation. In answering a vexing question about diet—the eating of food that had been offered to idols—he said “Whether you eat or drink or whatever you do, do it all for the glory of God” (1 Corinthians 10:31). And immediately following his declaration about salvation by grace alone through faith (Ephesians 2:8, 9), Paul said that “we are God’s handiwork, created in Christ Jesus to do good works” (verse 10). Elsewhere he asked, “Do you not know that your bodies are temples of the Holy Spirit, who is in you, whom you have received from God? You are not your own; you were bought at a price. Therefore honor God with your bodies” (1 Corinthians 6:19, 20; emphasis added). Thus, caring for one’s body—keeping it in shape, providing it with good nutrition, and keeping the mind clear—has a clear basis in the Bible. This expression of Paul that “you are not your own” is the key concept that links healthful living to faith. We humans need to view ourselves wholistically, where every aspect of our life and living is interconnected with every other. Our brains, which are the foundation of our spiritual nature and our connection with God, are clearly related to our diet, exercise, rest, sleep, and other health factors. A stressed mental state through wrong health habits results in the distress of our bodies and minds, as modern medical science clearly demonstrates. And the state of our physical health influences how we relate emotionally and spiritually to God and to others. Jesus said that the most basic of all biblical law is love for God and one another (Matthew 22:37–40). But only a healthy mind can fulfill this law optimally. Devout Christians should view themselves as “temples” of God, the dwelling place of the Holy Spirit. This may seem strange to some, including some Christians, but it has practical implications for Christian living. In Galatians 5:22, 23, Paul listed the fruit of the Holy Spirit’s presence in a believer’s life: love, joy, peace, forbearance, kindness, goodness, faithfulness, gentleness, and self-control. Who wouldn’t want to possess a personality with these attributes in his or her life! And who wouldn’t be attracted by them in others? The Spirit-controlled life is also a disciplined life, which tends toward physical, emotional, and spiritual health, which promotes longevity (who wouldn’t want that?) and a quality of life that some would “kill for.” And, as it turns out, the person with these attributes is exactly the sort of person one might expect to meet someday in heaven! Wikipedia, S. V. “Blue Zone,” last modified April 10, 2018, 15:53, https://en.wikipedia.org/wiki/Blue_Zone. Someone once defined “good health” as “the slowest rate at which one can die.” In our sin-affected and chemically polluted world, this has more than an element of truth to it. Good health—slowing down the decline—takes effort and self-control, improving and then maintaining our health status at an optimum level, thereby promoting a better, improved state of well-being. And while such a lifestyle is not a guarantee against illness, it can considerably reduce the risk factors for several of life’s major killers. As a result, if you adopt healthful eating and other health-promoting practices, you not only improve your chances of living longer but also enhance the quality of your life, especially in later years, as you enjoy the delayed benefits of physical and mental well-being. This all sounds good, but the benefits won’t be yours unless you’re prepared to ensure that your lifestyle is healthful. That may sound like hard work, and it takes self-discipline, but it will be worth it. In fact, once you get into the routine of a healthy lifestyle, you’ll find that it involves a lot of fun and enjoyment. So go for it! The principles of living a healthy lifestyle are simple. What people generally find to be the most difficult is accepting the need for such a lifestyle and responding with the appropriate attitude and necessary changes in their habits and behavior. Self-responsibility is fundamental to a program aimed at enhancing wellness, and individuals need to understand that they are responsible for their level of health. The choices made in regard to health will have an immense bearing on the level of health and happiness experienced.